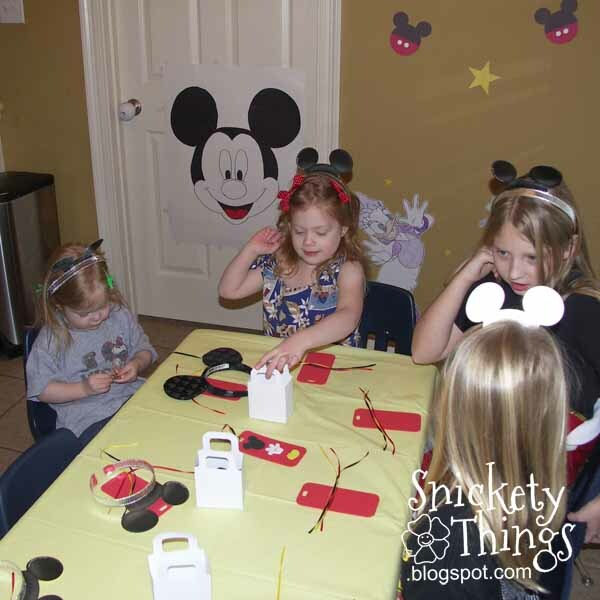 Remember that Mickey Mouse party Boo had for her third birthday? I had to decide how I wanted to entertain the kids during the party. Her birthday is in January and I never know how the weather will be on the day of her party. We have had everything from snow to a warm 74 degrees. 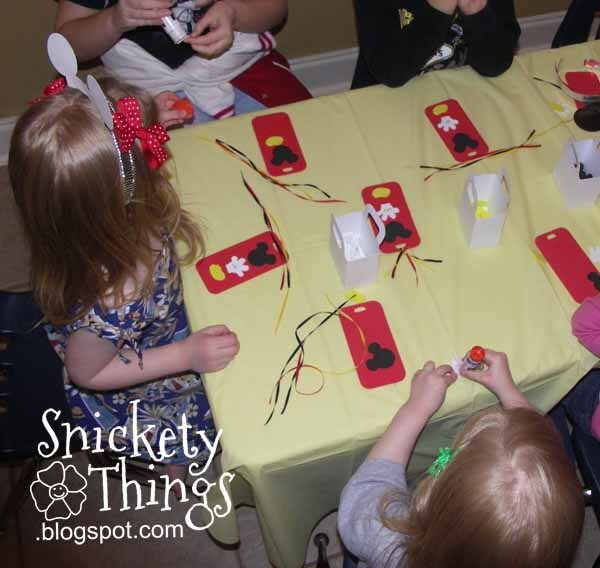 There weren't going to be many kids at the party so I decided that a craft and a game would be just fine. Here are my girls and my niece and a friend waiting for the rest of the party guests to arrive. I had an adjustable height table set up in the small eat in section of our kitchen. 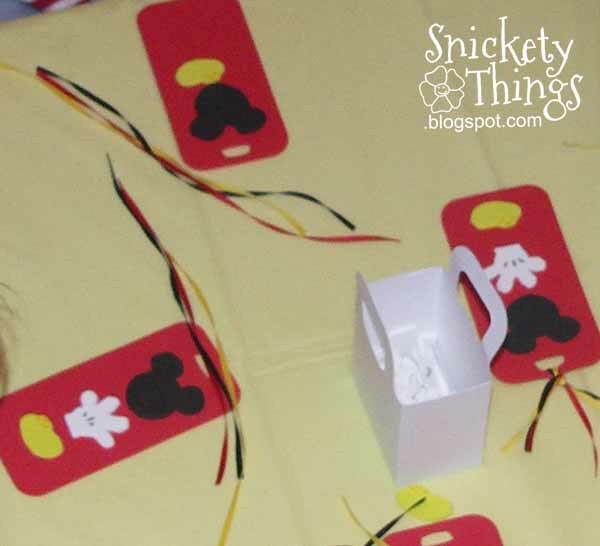 For the craft, I set out a bookmark cut out of red craft foam at each place for the kids. In each of those bags were the other pieces for the bookmarks. In the background you can see the large Mickey Mouse head used in out Pin-the-nose on Mickey Mouse game. Here are the kids gluing the pieces on their bookmarks. I cut out a glove shape out of white craft foam and added the little black lines with a fine Sharpie, the Mickey silhouette out of black craft foam and the shoe out of yellow craft foam using a yellow Sharpie to define the curve at the top. Here is a closer look at the bookmarks. It s a bit blurry because it in an enlargement from the above picture. I just used a bit of yellow, red and black ribbon to tie to the top of each bookmark. I know this seems like a very simple craft, but it took the kids a while to put them all together so it did fill a fair amount of time. We then moved on to our party game. 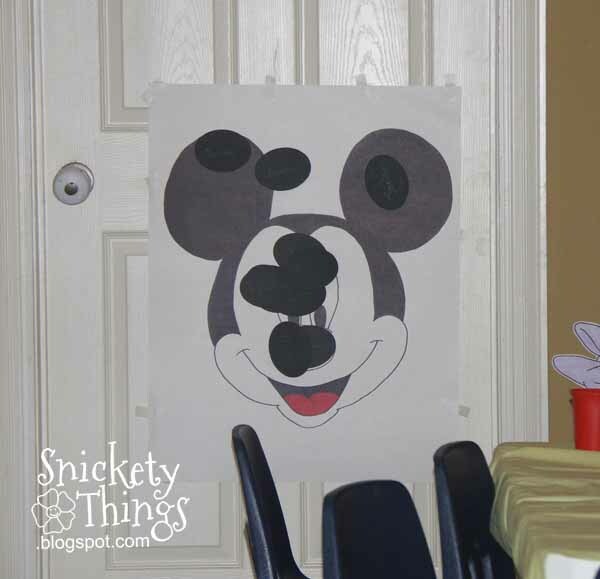 I had the large drawing of Mickey Mouse without his nose filled in. I used black card stock in an oval for each child. Here is Boo putting her nose on Mickey (I don't think she had her blindfold on very well). After the game was over, this is how poor Mickey looked. The kids really had a fun time with both activities. I will share how I do all my character blow ups in a future post. I'm not a good enough artist to say I drew that Mickey myself, but he is handmade. I just had some help. Your children are so blessed! Their friends must be thrilled every time they get an invitation for a play-date at your house! Thanks Jenny! I try to do something the kids will like. Sometimes it works well, sometimes not. I hope he has a very happy birthday! 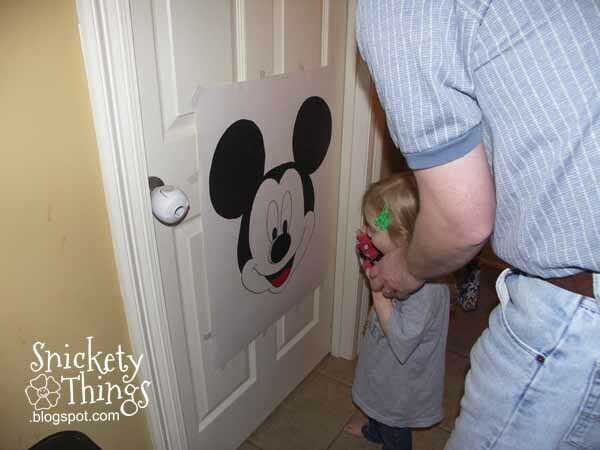 We love pin the something-on-anything games at our parties too. Very cute! We have also done pin-the-tiara in Fancy Nancy. They are a hit. What a fun party! 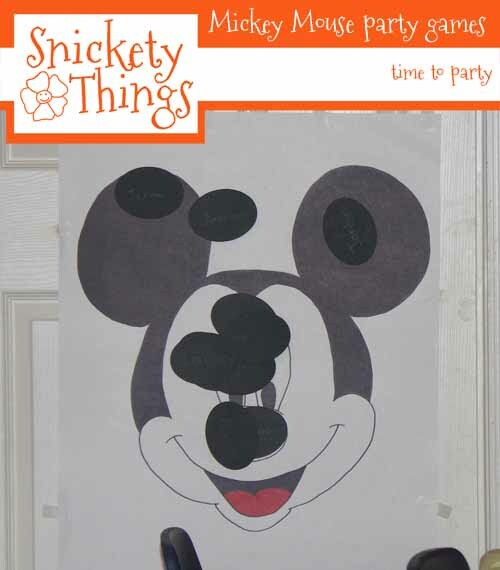 I love the pin the nose on Mickey! Darling! The party AND the little girl. Thank you for linking up on Fabulous Friday at Faith, Trust & Pixie Dust.